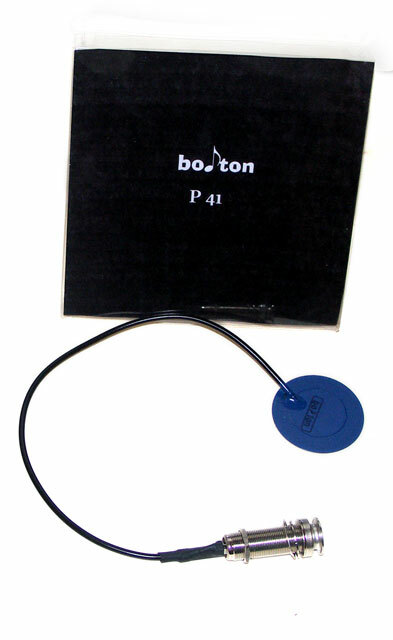 The boton P41 pickup has a much more balanced frequency response than the usual Piezo pickups and a pretty low impedance. It is therefore suitable for a number of applications where the sound needs to be picked up from the top of a stringed instrument. The boton P41 has been made to be built into an instrument. The connection can be accomplished through the plug endpin replacing the rear belt knob. The instrument can be plugged into any amp for accoustic instruments without using an external preamp since these devices usually have a high-impedance input. Common guitar amps usually have a too low-impedance input which leads to a thin and sharp sound of the amplified instrument. You might want to use a preamp in this case. The boton P41 can also be directly plugged in a mixer. The boton P 41‘s low weight does not affect the accoustic characteristics of an instrument.